The Ask – Adventures in Networking! Don’t think this is a book for fundraisers! How to ask for a promotion, raise, help, advice. This is a book about the mechanics of asking and it is brilliant. It’s also a current publication that takes the post-recession job and donation into consideration at every turn so if you’re afraid to ask because of this reason – this book will help you navigate this tough topic. Take a trip “behind the curtain” with a master multi-million dollar fundraiser, ex-lawyer and top-rated speaker ( I have heard her speak and she is top rated for a reason ) Laura Fredericks. The side by side comparisons of the social-profit and for-profit asking are very helpful because there are lessons to be learned by both types of professional. THANK YOU Laura for debunking the myth that if you want money – ask a rich person. Her entire chapter on how to engage, approach, research and ask the wealthy was not just illuminating it just may be worth the price of the entire book. 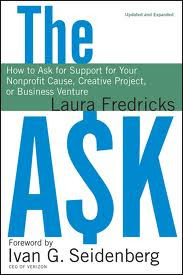 This book is filled with the WORDS of asking which again has never really been put down on paper in either for-profit or charity world. What the actual conversations look like. The chapter on “asking for yourself” – Wow. Big value. Very thoughtful and objective real world advice. Young people take note, a raise isn’t the only thing you should be asking for. This book walks you through title changes, pay increases and most importantly when NOT to ask and why. Take it from Laura who at Pace University managed hundreds of staff. Another ‘worth the price of the book’ chapter. Lastly and this is why every fundraiser, business person, board member and young professional should read this book. The chapters on “No” and “The response to your ask”. I honestly don’t think I’ve ever seen a non-negotiation book go so deeply into this topic. This is required reading for development professionals, Executive Diretors, board members and career hungry professionals in marketing and sales. This is an odd computer generated review – but a good one! This is a terrific review, about a great book, from a fantastic author. 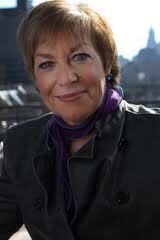 I, too, am a big fan of Laura Fredricks. I'm also grateful that she contributed generously to my own book: "Donor-Centered Planned Gift Marketing" (http://amzn.to/ffsvHM).